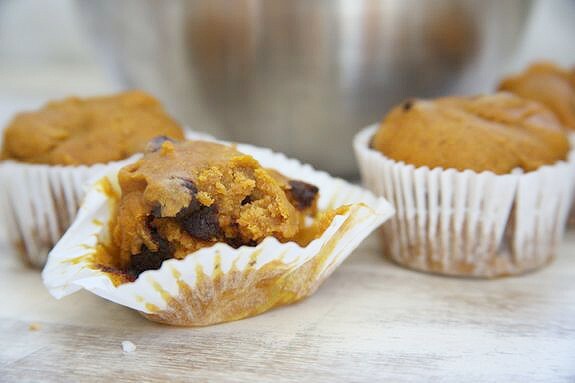 I am a pumpkin chocolate chip muffin addict. Since moving back to Nashville I’ve started a weekly routine of going to my favorite coffee shop – not for the coffee but for their insanely delicious pumpkin chocolate chip muffins. And then I buy three more and hide them from my children. :) So it’s a little dangerous that I’ve come up with a recipe that’s as good as the original. And with some cream cheese frosting, you’ll be hiding them from your kids too! I’m throwing myself a little birthday party later this month (pumpkin chocolate muffins are definitely on the menu!) 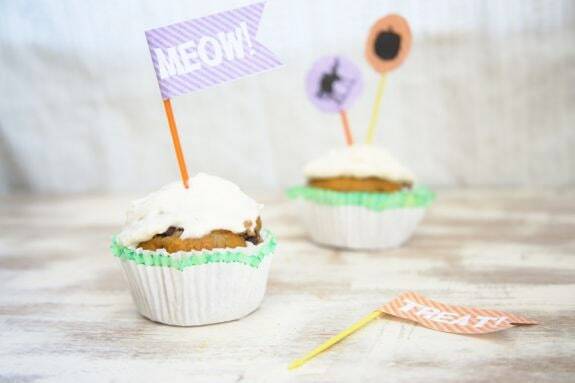 so I asked Katie to create some cute Halloween cupcake/muffin toppers. Aren’t these adorable? They nicely distract from my inability to apply icing, right? Read on for the recipe and download! 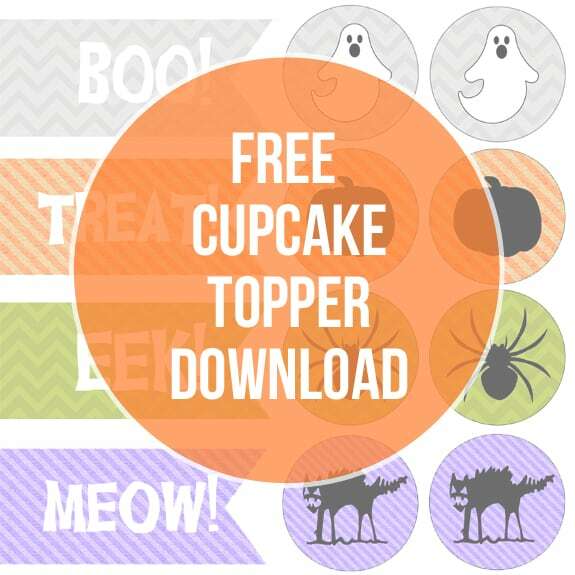 Download the Halloween toppers. Then print and either cut them out with scissors or use a 2-inch craft punch for the circles. 1. Preheat oven to 350 and either spray a muffin tin or use cupcake liners. I recommend spraying the pan instead of using liners because the muffins are so moist that it’s very difficult to get the wrapper off. 2. Mix together the pumpkin, brown sugar, water, oil, and vanilla in a large bowl. 3. Then add flour, baking soda, salt and chocolate chips and mix thoroughly. 4. Pour batter into muffin tin and bake for 20-25 minutes. Cool completely before frosting. 5. To make the frosting beat the cream cheese, maple syrup, vanilla and salt until creamy. Then apply to the muffins (hopefully better than I did). My sister LOVES to bake and I LOVE to eat her treats…I am sending her the link to this recipe now! These are PERFECT with a morning cup of coffee. Delish! And I LOVE the cupcake toppers – toooo cute! 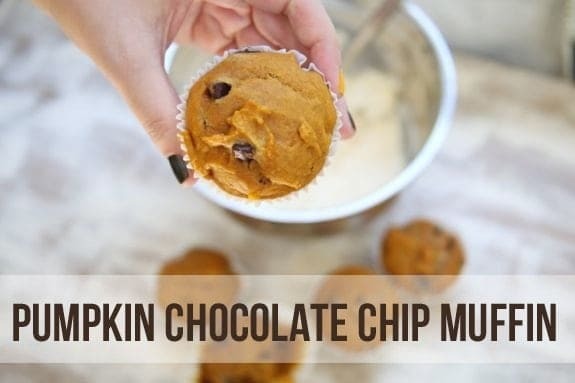 I have never added chocolate chips to my pumpkin concoctions before, but you better believe I’m going to this year!